With all the hubbub with #HotSummerEats recently and with C.L.U.E. reveal day hot on its heels, we’ve been pretty busy around Eliot’s Eats. There have definitely been some good eats around here. On to June’s C.L.U.E. reveal. Cook, Learn, Undertake and EAT (also known as the C.L.U.E. Society) is a similar to the board game of CLUE. It involves secrecy, fun, challenge and cooperation with the other game playing members. But don’t be alarmed, there are no murders in our society. I was elated for my pairing for June: Cooking on the Ranch. I have followed Lea Ann’s blog for a long time, even before C.L.U.E. And, I was also excited for this month’s theme: Picnic Foods. Some of our most romantic dates have been on picnics. Let’s see if I can summarize. There was the great picnic at Shakespeare on the Lawn at Philbrook in 1992. We even took my best friend along even though we had only been dating a few months. Then, there was another most romantic picnic (back at Philbrook) for a movie on the lawn event where The Hubs presented me with the best gift ever. (There was a lot going on in our lives that summer of 2007 and I may share more about this special evening at some point.) Most recently was our evening at Guthrie Green listening to Sam Baker, et al. Some of these picnics have included store bought or restaurant items, but the most special al fresco dining found homemade treats in our picnic basket. I scored big as I perused Lea Ann’s site. Our picnics tend to be composed of appetizers and finger foods so these three recipes got packed into my basket immediately. A shake of salt and pepper. Serve on classic white bread for sandwiches. Serve with crackers as a dip. Serve on top of grilled burgers for a new twist on a cheeseburger. Or, even better yet, stuff it into a burger before grilling. Thank you Lea Ann for a great classic recipe with just the right amount of smoky heat. For Lea Ann’s Spanish Deviled Eggs, I cut down the size of the recipe to make a picnic for just two. For the original recipe for a dozen eggs, click here. Hard boil eggs. Slice eggs lengthwise, remove yolks and place yolks in a medium bowl. Arrange egg white halves in your favorite Deviled Egg serving bowl. To prepare filling, cook chorizo in a skillet over medium heat, stirring occasionally until crisp. Meanwhile add cilantro, red pepper, vinegar, mayo, mustard and water to yolks. Mash. Taste and adjust seasoning with salt and pepper. I could not find any Spanish chorizo (which is cured). I substituted 1 large slice of Italian salami that I chopped and cooked until crisp. Add some basil on top and I think you could call these Italian eggs. 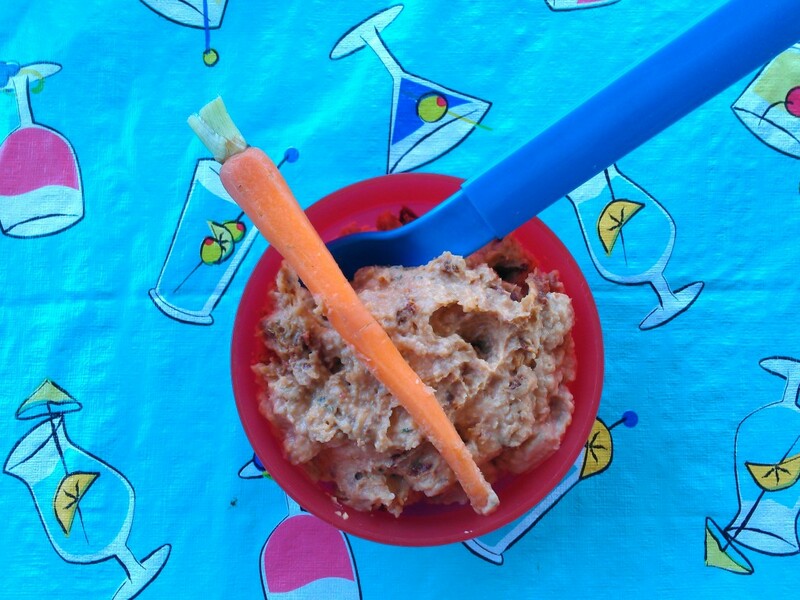 Finally, her Sun-Dried Tomato Hummus is another keeper. Not only did we take this on our C.L.U.E. picnic, but I also rolled up the leftovers with some kale in a dried tomato wrap. This creation could also be on our menu the next time we picnic. 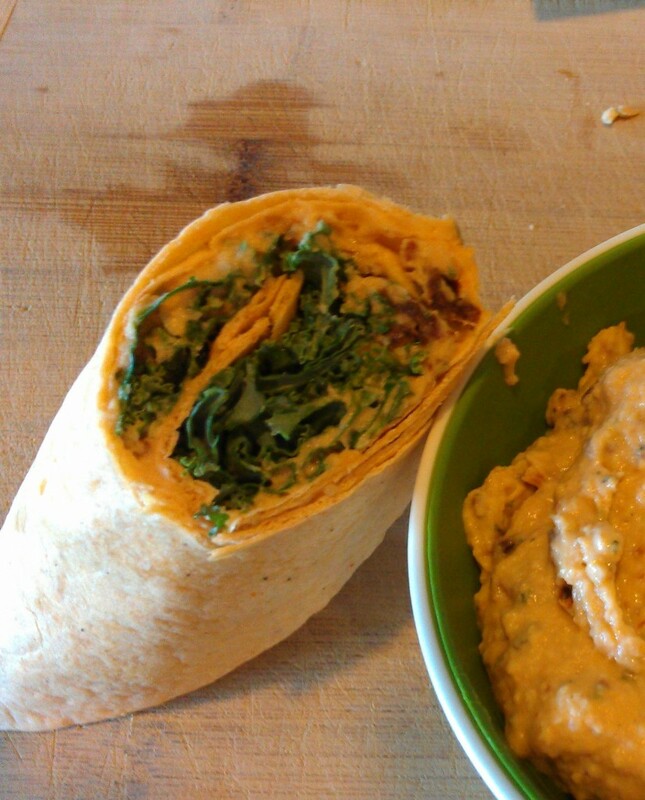 For Lea Ann’s recipe, for Sun-Dried Tomato Hummus, click here. Disclaimer, this was not an extravagant picnic at Philbrook or Guthrie Green. Rather it was a relaxing mid-afternoon interlude on our patio. Rest assured, however, the next time we need to pack the basket up, we will be taking along these items. Check back here on July 8 for the next C.L.U.E Assignment where the theme is Summer BBQ and Grilling. I can’t wait. Wow, three great recipes for a perfect summer picnic. I will anxiously await your post about the best gift ever! Well look who got me this month! Regarding that white cheddar, I’ve not seen it for a long time either. It was an “anniversary” thing and I wonder if it was only available for a period of time. Darnit – it was delicious. 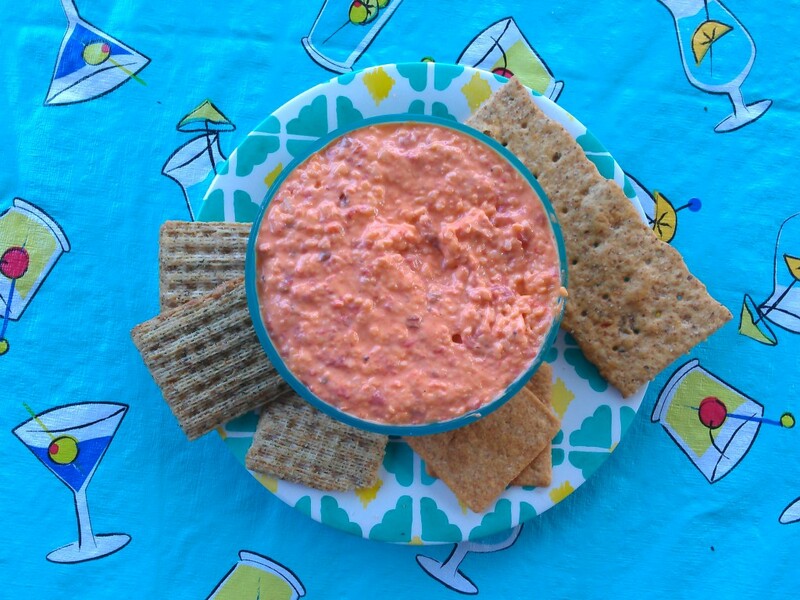 This pimento spread recipe comes from a good friend and I must say it’s very tasty. Great choice for our picnic event. And, I had almost forgotten about those eggs. I must make those again soon. And last – I love what you did with that hummus. My gosh – It’s nearly lunchtime here and my mouth is watering! 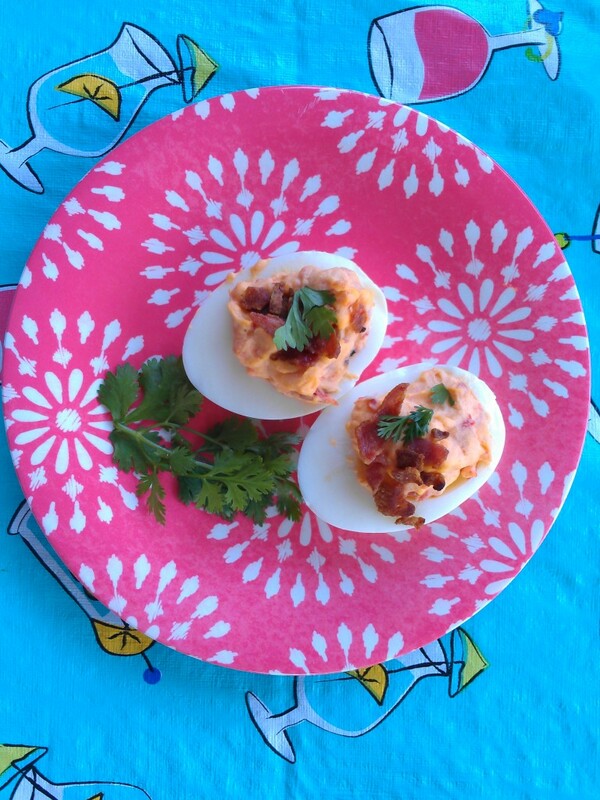 These three recipes are so delicious looking………….I really want to try that deviled egg recipe soon! 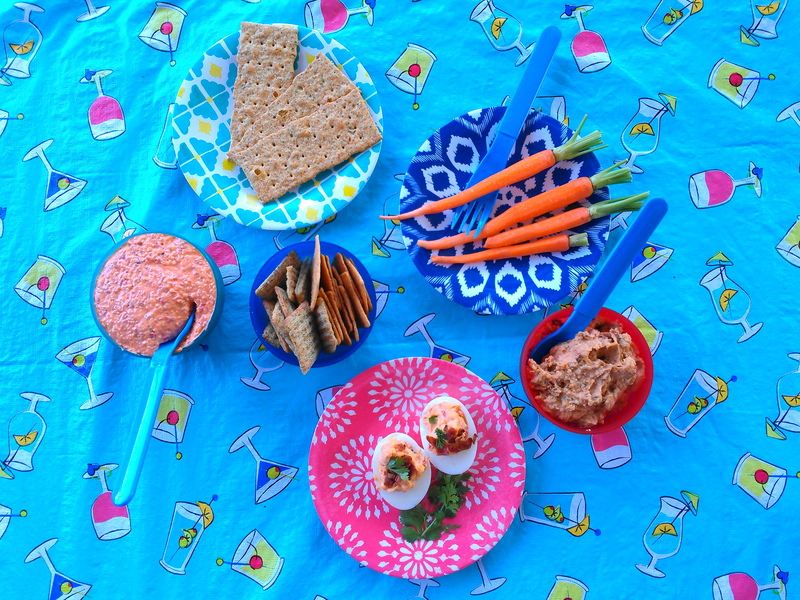 Appetizers keep a picnic simple….these are wonderful selections! I am intrigued by the Spanish Deviled Eggs…they sound delicious. Great picnic fare…. Lea Ann’s blog is great, isn’t it? I love spicy deviled eggs! These look terrific! Fun post — thanks so much. This dip sounds AMAZING and addicitive! Perfect for a lazy weekend picnic. Nice choice. Everything looks so delicious, Debra, must try that dip soon! Perfect for picnic, or snack or whatever! It’s summer and you can munch all day long! Wow! you made an entire picnic! fantastic! Mmmmmm, I want it all – but I’m thinking I could live on the cheese spread! Ooooh I LOVE Pimento cheese dip!! I have never had it with chorizo, what a great idea. Must try this soon. Great picnic option. Oh, this is my kind of cheesy spread. I can’t wait to make this soon! I grew up eating pimento cheese sandwiches and they were always a favorite. Love this spicy updated version! And those deviled eggs! I want those too!